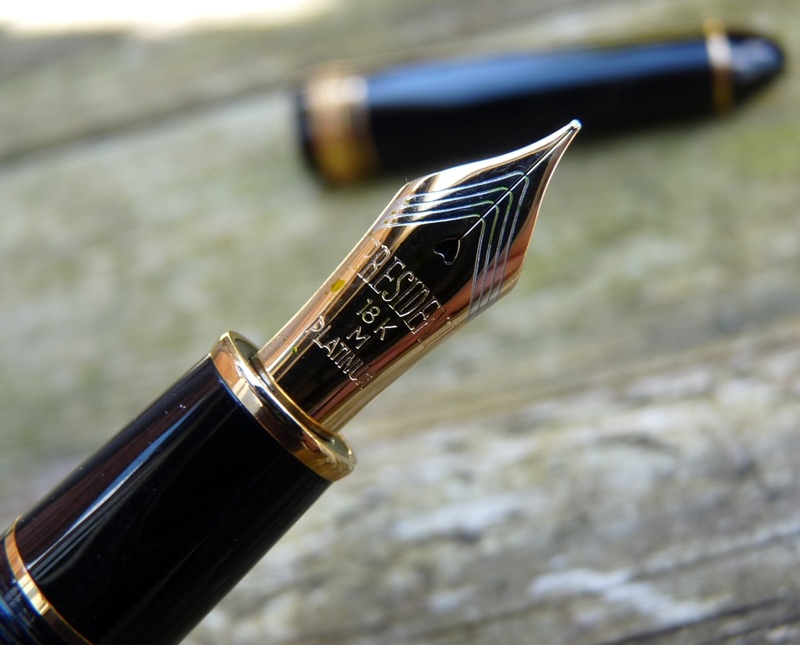 Platinum President Fountain Pen Review – Pens! Paper! Pencils! 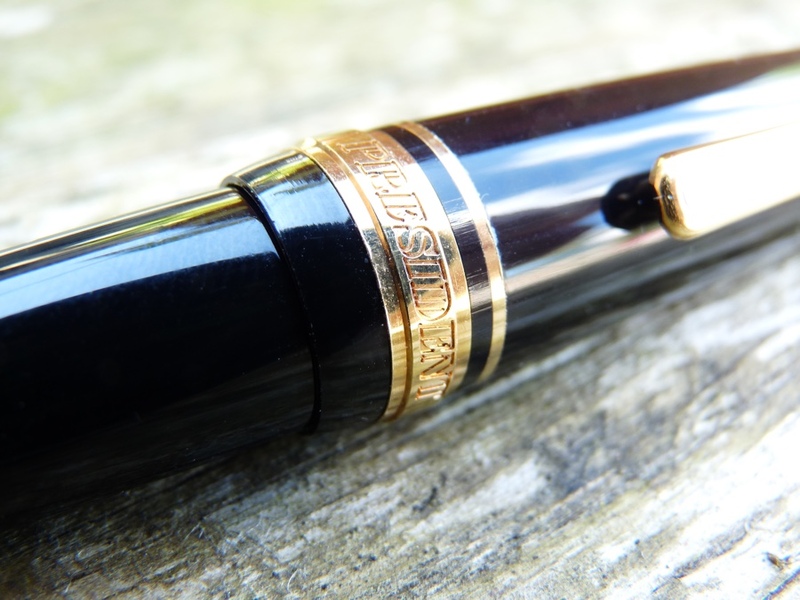 The Platinum President is a cartridge/converter fountain pen available with nibs from extra fine to broad. The one I’m reviewing has a medium nib. It costs about $220 in the USA or £140 in the UK. It’s available with different barrel colour and trim options for more of your money. The President is quite a large pen. 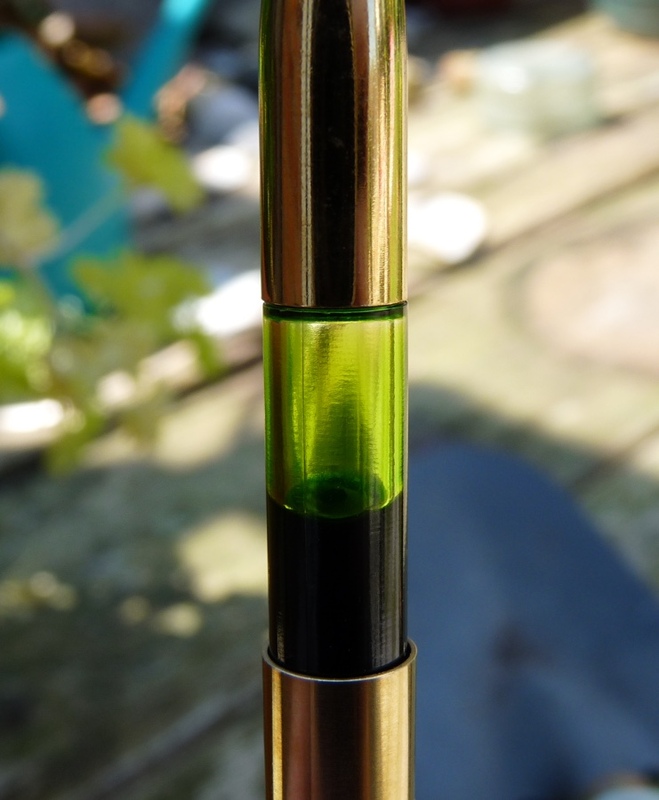 The picture below shows how it compares to the Platinum #3776 Sai. 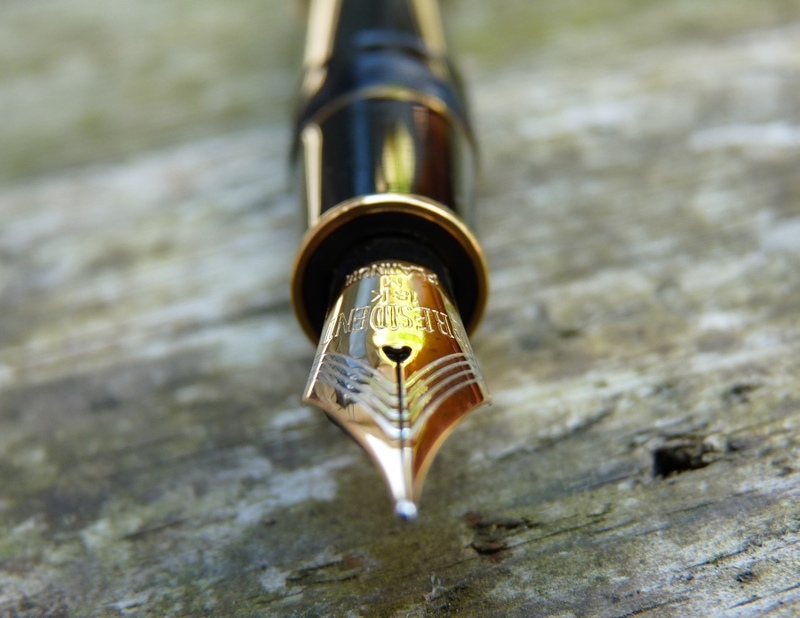 The size is comfortable, particularly as the pen is light and very well balanced, and lends some presence to the pen. I received this pen from Massdrop for review purposes and I wouldn’t have chosen a black and gold pen in a million years. I do think the rhodium version looks better (but not so much better it’s worth the extra $100 being asked for it). However, if you like this style of pen I think you’ll be pleased with the quality of the finish. It’s even won me over a little. There are little Art Deco touches on the nib and clip which I love. Anything Art Deco is off to a good start with me. The overall effect is very classy. 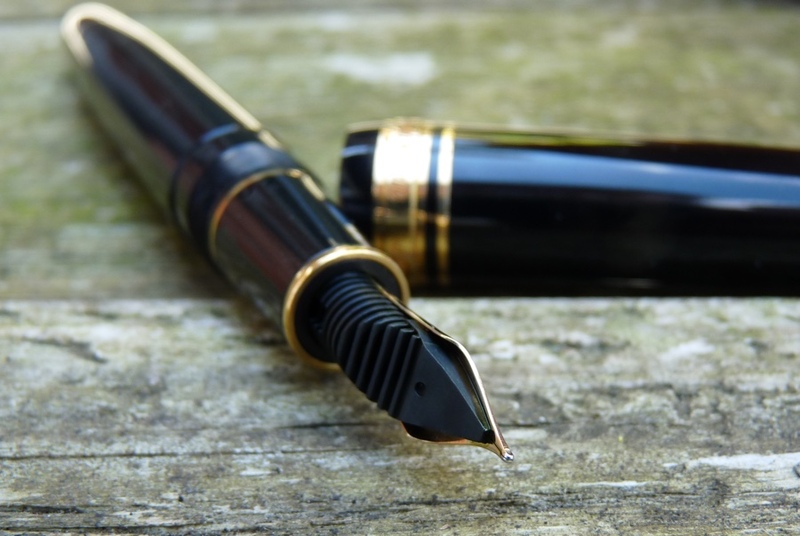 This is a pen that is makes a statement: it’s called the President, after all. The nib is beautiful. 18K gold with rhodium accents. It writes wonderfully, too. 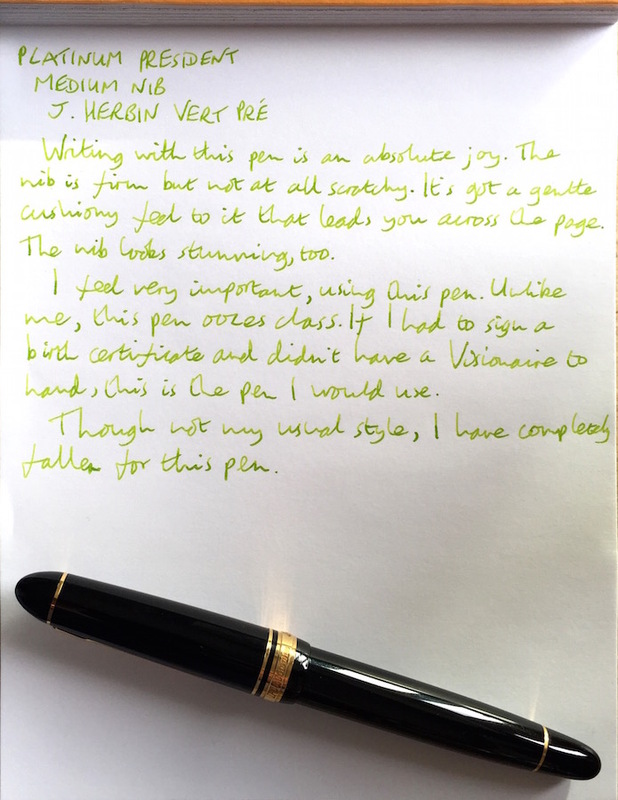 It’s firm – you are not going to get any flex from it – but when you write with it it feels incredibly smooth. Ink flows well; about in the middle of the dry-to-wet scale. It’s quite possibly the best nib I own. Platinum use proprietary cartridges and converters. My pen came with a gold finished converter which works well enough. The cap screws closed and pushes on to post securely. The clip is fairly firm and does what it’s supposed to do. In many respects there’s nothing spectacular about this pen. It’s a classic shape, it’s cartridge/converter and it’s black and gold. However each part has something extra to add. The barrel is a little larger; the trim has stylish little touches; the nib is, actually, exceptional. This is not a pen I would have picked to buy myself but I’m glad to have it in my collection. Many thanks to Massdrop for sending me this pen. If you haven’t heard of Massdrop then go and check them out. Although not every deal they offer is a total bargain, many are, and there are always new products to tempt you each time you visit. It’s a members only site but it’s free to join and if you do you get to have a say in the products they offer in the future.